It’s officially spring and with a bit of luck you can finally ditch that winter coat – or at least hang it in the back of your closet. Fortunately for you, Gentlemen, spring is one of best times of the year to show off your style. Why? The sportcoat. If you don’t own one, you must invest in one immediately. It can be cotton, tweed, wool, or linen; lined or unlined; brown, black, khaki, blue, or just about any color. It can be plaid. It can be worn to work, on the weekend, with jeans, with slacks, the rules are simply this: it must fit well. 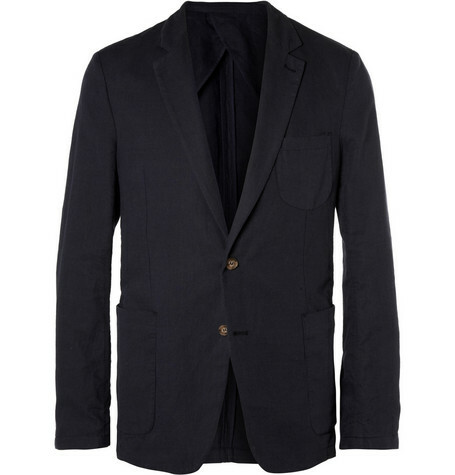 Seriously, the sport coat is probably the most versatile item you can have in your closet. It replaces the need for a spring jacket (unless it’s raining but we’ll talk about rain gear in another post), and is the ideal piece for layering. On cool days wear a shirt, sweater and lightweight scarf, you can even wear a lightweight vest under it. On warmer days lose the sweater and wear it with simply a crisp white button down. On weekends, wear it with a t-shirt to walk the dog and get a coffee. While a grey or neutral sport coat is a good starting point and go to staple, a color or plaid adds interest and a shot of style. In an ideal world you’ll buy two: one casual, unlined, super comfortable, sweatshirt replacement, the other slightly more structured, ideal for the office. I’ve done some hunting and here’s what I found.